Do you enjoy the taste of beef but worry about the saturated fat and cholesterol content? Look no further than the Red River Valley Ranch in Walhalla, N.D. Recently, my artist twin sister Barb, her husband Paul, and I took a road trip up to Walhalla. We had three agendas: Do a little hiking in the Pembina Gorge, visit the Brunch Bunch Art Show and visit Ed and Connie Jonas, owners of the Red River Valley Ranch. The Jonases have created a low-fat, low-cholesterol meat called HighMont Beef by breeding together two types of cattle: the Scottish Highlander and the Italian Piedmontese. (Think “high” for Highlander, and “mont” for Piedmontese.) They started this operation back in 2003 in Montana, and a year and a half ago, moved it to Walhalla for the rich soil and grazing land. When I asked if I could taste it, I was invited to lunch and for a tour of the ranch. Ed grilled burgers for us, and to truly taste the meat, I decided to forego ketchup and mustard. I asked Ed for a “well-done burger” and the look on his face was that of a chef who cringes in the kitchen when such an order is made. He was concerned it would change the flavor too much, but I didn’t budge, so he delivered a well-done burger with fried onions on a homemade oatmeal bun made by Connie. My brother-in-law, Paul, took his more rare. My sister, a nonbeef eater, declined the meat, but enjoyed the rest of the meal. As an RD, I was impressed. I hear about the “cardboard” taste of many foods that are low in fat. This meat was not tough, even when served well-done, and it had a flavor that was better than any meat I have tried. I tend to not focus on cholesterol content when discussing heart-healthy meals, since it is saturated fat in food that tends to raise our blood cholesterol, and I put my focus there. The cattle are fed an all-natural diet of oats, flax and mineral water. They also have access to straw mounds and allowed to roam freely on the chemical-free grass and hay. Despite having about 50 cattle, Ed knows each one by name. There’s Pretty Girl and Pretty Woman. Then there’s Flash and her calf, Bulb. Onto Percy, Gus, Nutmeg, Dulce and the Christmas calf, Noelle. As more cattle roamed around, we met them each by name. The bulls are allowed to choose their own “girlfriends,” and they mate naturally instead of a forced environment. The cows are encouraged to nurse their young and enjoy the beautiful outdoors as a family. The males are assessed for size, and “confirmation,” as determined by the length of the back. The longer the distance between head and tail, the better. Those with less than ideal confirmation are castrated and turned into “steers.” After 27 months, these steers are candidates for processing. While this may seem harsh, keep in mind that many cattle that are fed growth hormones have a much shorter life. Once the steers are processed for meat, Ed and Connie personally deliver it to buyers. This is cheaper than shipping it commercially and gives them an opportunity to know their customers. HighMont beef at the Red River Valley Ranch … another N.D. treasure to enjoy! Please check out the following gallery of photos taken by Barbara Benda Nagle and myself. 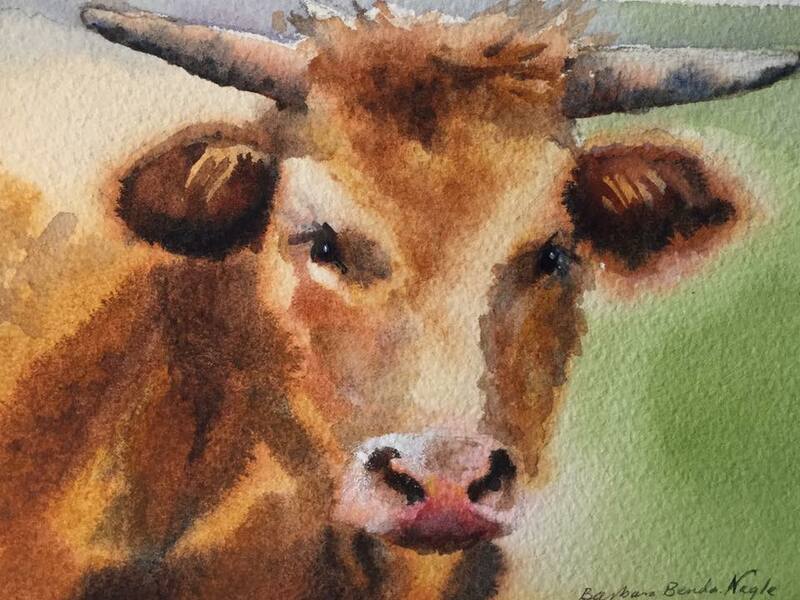 Barbara Benda Nagle provided the watercolor artwork. Ed and Connie Jonas, with their dog, Winchester. this is great info Bev! thanks for opening my mind to another product….Are their products available for purchase? I guess I’ll try their website! thanks again!